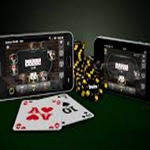 Mobile Poker is quickly becoming the second leading casino game in the mobile gambling market. The only game which continues to remain more popular are video slots but this doesn’t mean that poker won’t be able to compete on the same level. Technavio, a research gambling firm revealed earlier on this week that mobile gambling will grow by 43% and 26% of that will be thanks to mobile poker. Mobile gambling and poker as a whole are rising in popularity unlike the online gambling market did. The reasoning for this is because the mass majority of people would rather have the option to have a hand on experience than a plastic, fake experience through a desktop computer. The realism factor is taken to another level with mobile devices. This study was conducted by analyzing how much is made through gambling on mobile phones/tablets. Technavio then multiplied that amount by total amount of wagers made by players on an annual basis. They found that a mass increase of extra money was earned annually. There have been dozens of mobile casinos who have stated that their player percentages are rising by 7% annually which was also factored into this study. It’ll be interesting to see is the analysts and researchers are correct about the mobile gambling industries growth. Most believe that the mobile gambling market will be able to surpass the online gambling market within the next decade. None the less mobile poker will grow by twenty six percent in the next four years which will only benefit players around the world.